The difficult second novel. In his, Mitchell seems to have taken the decision to throw any number of things at the wall to see what might stick. It has its moments certainly but while being easy enough to follow on the level of the prose is not quite a straightforward read. It is told in nine sections; Panopticon, Lost Property, Video Games, Reclaimed Land, Study of Tales, Kaiten, Cards, The Language of Mountains is Rain. The thread it hangs on is the search by Eiji Miyake for his father, who abandoned his mistress, mother to Eiji and his sister Anju, when they were young. Eiji has come to Tokyo from the sticks (an island called Kagoshima) to make himself known. We first find him in a café opposite the PanOpticon building waiting to meet his father’s lawyer, Akiko Katō, an encounter he fantasises about several times. The shifting ground of the novel starts here. From that point on the reader can never be entirely certain which of the incidents we are presented with are supposed to be occurring only within Eiji’s mind and which are meant to be “real”. But his burgeoning relationship with part-time waitress and proficient musician, Ai Imajō, the nape of whose neck is perfect, does give something to grab on to. We follow the ups and downs of Eiji’s search, through an unfruitful meeting with Ms Katō, another with an ageing admiral from whom he learns his father’s family name is Tsukiyama, and also with his father’s wife and daughter, not to mention his falling into the orbit of the Yakuza and out again. His motives aren’t mercenary. But others find that difficult to believe. I must say I’ve read a fair bit of Japanese fiction and the characters here – Yakuza perhaps aside, but gangsters are gangsters the world over – don’t follow the behaviour, or speech, patterns of those in books written by Japanese authors. When Mitchell returned to Japan, in The Thousand Autumns of Jacob de Zoet, it was to the country well before its opening to the West, in Napoleonic times, and his Japanese characters seemed to me to behave as such. You could call Mitchell’s approach playfulness. Or you could call it irritating. At one point Eiji is hiding out from the Yakuza in a house where a novel’s manuscript is lying about. He of course reads it and so we are given extracts. Its main characters are called Goatwriter (himself a writer,) Mrs Comb (one of those “comedy” earthy charlady types with non-received pronunciation,) and Pithecanthropus. Here we are vouchsafed the information that due to a gentleman’s agreement soldiers never fight each other – “They might get hurt,” – and that, “The purpose of war is to kill as many civilians as possible.’” Also, “‘Writing is not about ‘fulfilment!’ Writing is about adoration! Glamour! Awards!’ …. ‘I learned the language of writers, ‘coda’ and ‘conceit’ for ‘ending’ and ‘idea’; ‘tour de force’ instead of ‘the good bit’; ‘cult classic’ instead of ‘this rubbish will never sell’.” This is a novel wherein is made literal the sentence, “Goatwriter’s words stuck in his throat,” and contains the line, “‘A stream of consciousness’ he rejoyced.” All well and good, but it seems more designed to show off the author’s facility with word-play rather than advance either the plot or knowledge of human relationships. 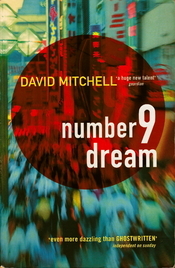 In Number9Dream Mitchell seems to have pushed his conceits as far as he thought he could get away with. (And possibly beyond.) Still, I’d never thought to see the word zwitterion in a literary novel; hats off to that. A hint that this may be considered an altered history comes in an entry in an exquisitely written, intriguing, realistically toned journal supposedly from 1944 of a Tsukiyama ancestor who was a pilot on the kaiten project (the submarine equivalent of the kamikaze) which makes reference to someone who threw himself under a Russian tank with a bomb and also mentions stories of the Soviets’ cruelty in Manchūkuo. In our world the Soviets didn’t declare war on Japan till after Hitler was defeated in 1945. But in a work such as this where so much is invention in the narrator’s mind this could be another example. On the other hand it could simply be a mistake by Mitchell. There is not much solid ground to hang on to here. This is particularly so when, within the ‘present day’ span of the book a huge earthquake strikes the Tokyo area. This, of course, has not happened in the reader’s time-line. In a variation of the man stepping into the same river some time later conundrum Eiji thinks, “A book you read is not the same book as before you read it. Maybe a girl you sleep with is not the same girl you went to bed with.” Is this taking philosophical speculation too far? If you were counting earlier there were only eight named sections. The ninth is untitled and contains solely a blank page. Presumably the dream. Which only leaves the question, is Number9Dream a ‘tour de force’ or perhaps a ‘cult classic’?